Nana Turton’s Sherry Jelly with whipped cream was traditionally served at Christmas or New Years Eve when Jennifer was growing up. “Although we found the Sherry flavor somewhat potent as children, my brothers, sisters, cousins and I still relished the dessert. With the transition of our family orchard into grapevines and winemaking it seemed only natural to try using wine instead of sherry in Nana’s recipe. Pinotage Rosé is one of my personal favourites. Its vivid strawberry notes and mouthwatering acidity make a delicious, flavorful jelly.” And it is so darn pretty! This is a make ahead dish! 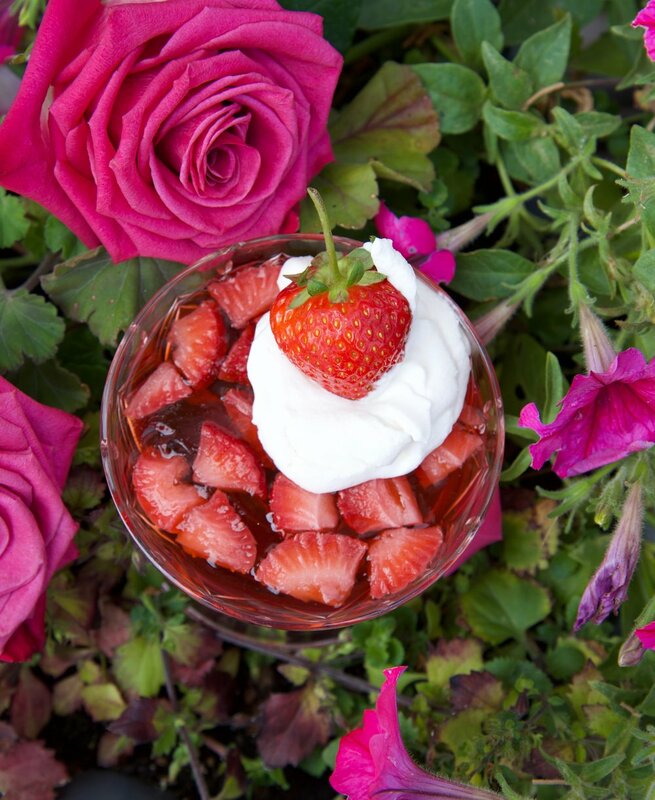 Place the rosé wine and sliced strawberries in a bowl and allow to steep for half an hour. Strain the wine into a saucepan and keep the strawberries to one side. Heat the wine until nearly boiling and add vanilla and then stir in the sugar until it dissolves. Remove from heat. “Bloom” the gelatin powder by stirring approximately ¼ cup cold water into it and stirring until it has a thick, smooth paste consistency. Add 1/3 of the hot wine to the gelatin paste and mix until the gelatin is evenly dissolved and no lumps remain and then add this mixture back into the rest of the wine and whisk it in until dissolved. Divide the sliced strawberries equally into 6 clear glass serving bowls or large stemless wine glasses and pour the wine/gelatin mixture over the top. Allow jellies to set in the fridge overnight or at least for 3-4 hours. Remove from the fridge 15 minutes before serving and top with whipped cream and a fresh strawberry garnish. The View’s signature Pinotage grapes are the basis for all of their rosé wines. This Rosé has won multiple gold awards nationally and been awarded Best Rosé at the Best of BC Wine Awards 2011. Thee only one of its kind in North America, it boasts intense aromas of strawberry and cotton candy followed by flavours of pink grapefruit and tart cranberry. A dry, crisp finish and pleasing fruit notes add to its elegance. Pinotage Rosé pairs well with poultry, arugula, strawberry and walnut salad, Caprese salad or prosciutto and balsamic flatbread and makes great jelly! This easy pie is absolutely scrumptious and is a unique addition to your regular fruit pie repertoire. The brilliant ruby red colour of rhubarb and tart zing will make this a new family favorite. This is the perfect dessert to celebrate spring and the first growth in your garden. Pour hot water over rhubarb in a large bowl, stir in baking soda and let sit. In mixer beat together eggs, milk, flour, sugar and butter. Drain rhubarb and add to mixer. Fill unbaked pie shell – arrange lattice topping. Bake for 1 1/2 hours at 350 degrees on oven rack (one below middle). Forklore: Stories about the passionate people behind the BC food, wine & farm world and beyond.